Members and staff at the South Carolina Maritime Museum in Georgetown are excited to announce that starting in August, the history of early colonial commercial boats will become much clearer with the display of a model of the Brown’s Ferry Vessel. The model will be unveiled during a special invitation-only event to be held from 5:30-7 p.m. on Friday, July 31, when its designer and several prominent underwater archaeologists will be on hand to describe the original vessel’s recovery and the significance of its design and construction. Attendees will also be treated to images and a video of artifacts found aboard the vessel. 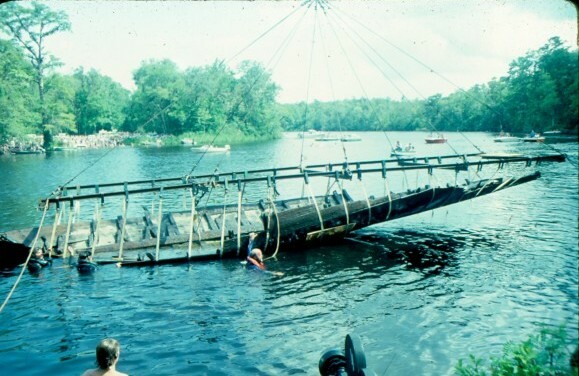 The Brown’s Ferry Vessel was discovered in the early 1970s, by diver Hampton Shuping, at a depth of 20 feet in the Black River near Brown’s Ferry Landing. It was recovered in 1976 and taken to Fort Jackson near Columbia where its parts were kept wet to prevent further deterioration. From 1977-1983 it was maintained in a farm pond before being moved to the Institute of Archaeology and Anthropology at the University of South Carolina. The vessel’s woods – live oak, cypress and pine – were conserved by slowly replacing the water in the wood cells with polyethylene glycol, a process that took more than nine years. In 1992 it was moved to the Rice Museum in Georgetown, where it is still on display. Not all of the original vessel was recovered – some refer to what’s left as a skeleton – but the many pieces that were salvaged and reattached tell a fascinating chapter in history when colonists were working to build society in a relative wilderness. Its design shows a thoughtful implementation of adaptations over time to create a sturdy mode of transporting goods along South Carolina waterways. The vessel’s remains, and research by Dr. Fred Hocker, helped Edward Scott produce plans for re-creating a full model. William Brady constructed the model and now, for the first time, people can see an accurate model of the vessel. The river barge is about 50 feet long, 14 feet wide and 4 feet tall, and it was originally constructed of live oak, cypress and pine. It had two sails, and the flat and heavy bottom let it slide onto banks where there were no wharves or piers. The Brown’s Ferry Vessel sank carrying 25 tons of bricks. Artifacts recovered – including green glass English wine bottles, oars, millstones, iron pots, a straight razor and smoking pipes made of gourds – enabled historians to date the time of its sinking to between 1730 and 1740. This period is about 50 years earlier than previous American shipbuilding discoveries, and in 1979 Professor J. Richard Steffy of the Institute of Nautical Archaeology at Texas A&M said it was, “…the most important single nautical discovery in the United States to date.” It is the oldest commercial vessel recovered in the southeastern United States. Nautical history fans can visit the remains of the original Brown’s Ferry Vessel at the Georgetown Rice Museum at 633 Front St., from 10 a.m. to 4:30 p.m. Mondays-Saturdays. Admission is $7 ages 22-59, $5 ages 60 and older, $3 ages 6-21 and free for ages 6 and younger when accompanied by an adult. The Brown’s Ferry Vessel model is on display starting Aug. 1 at the South Carolina Maritime Museum at 729 Front St. in Georgetown. Its operating hours are 11 a.m.-5 p.m. Mondays through Saturdays, and while admission is free, donations are appreciated.